Jay & Jay Industries was contracted by a large scale Property development company to design and install a solution for controlling run off into the Coomera River during construction. 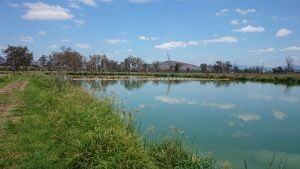 Large storms with heavy rain had caused all containment ponds on site to reach capacity. 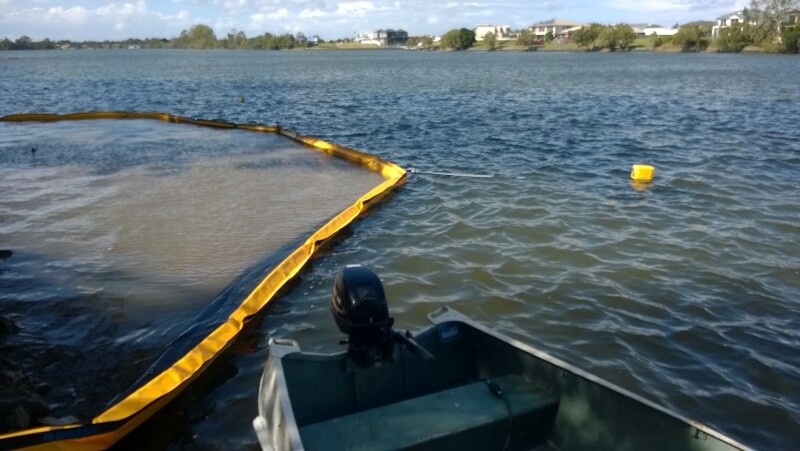 Site run off of small particle soil was creating a large bloom into Coomera River. 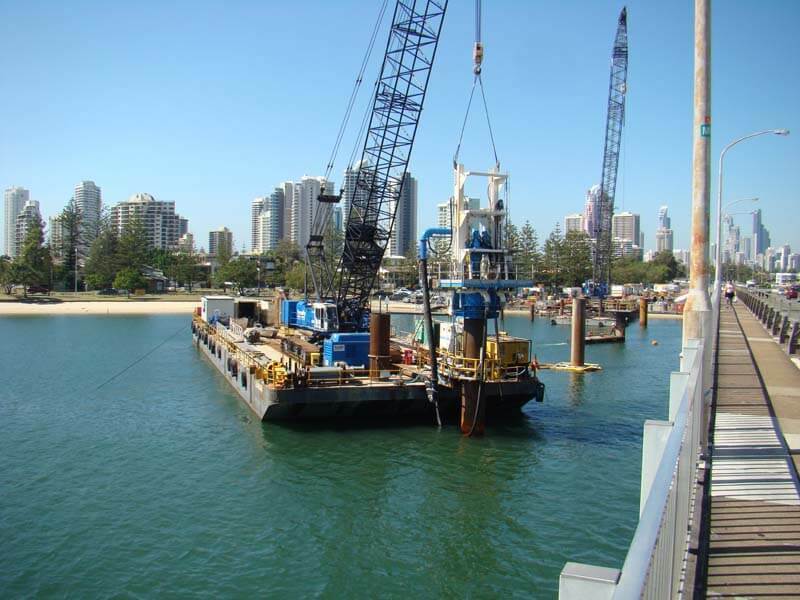 This project was further complicated by many large waterfront homes were facing directly into the work site and Coomera River is an iconic Gold Coast waterway. 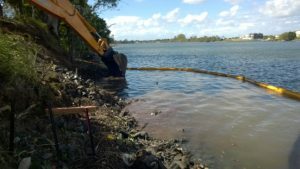 The Gold Coast council environment officers and Dept. of Environment and Heritage had already been on site issuing warning notices. 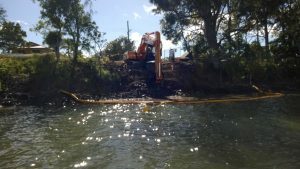 Jay & Jay Industries was tasked with liaising with Silt fencing contractors to design and oversee multiple silt fencing runs to channel runoff water from the site. 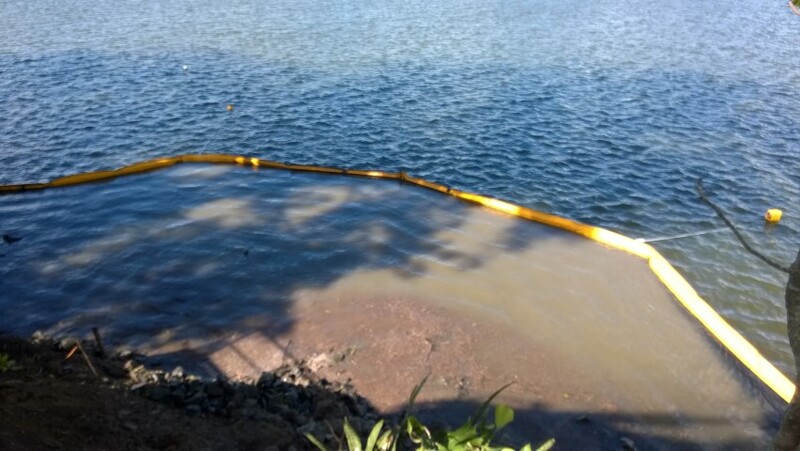 Once effective control of runoff was installed J&J took charge of pumping the standing water from pits through dewatering bags and directing the flow to the second of the proposed location of Silt and Sediment booms. 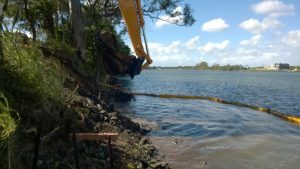 The next stage of the project was the supply and installation of 2 separate locations of Silt and Sediment booms in Coomera River. 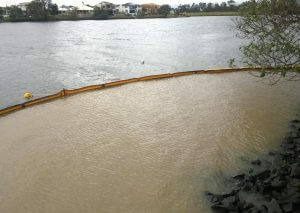 Because of the large-scale development water was flowing into Coomera River 300 meters apart. 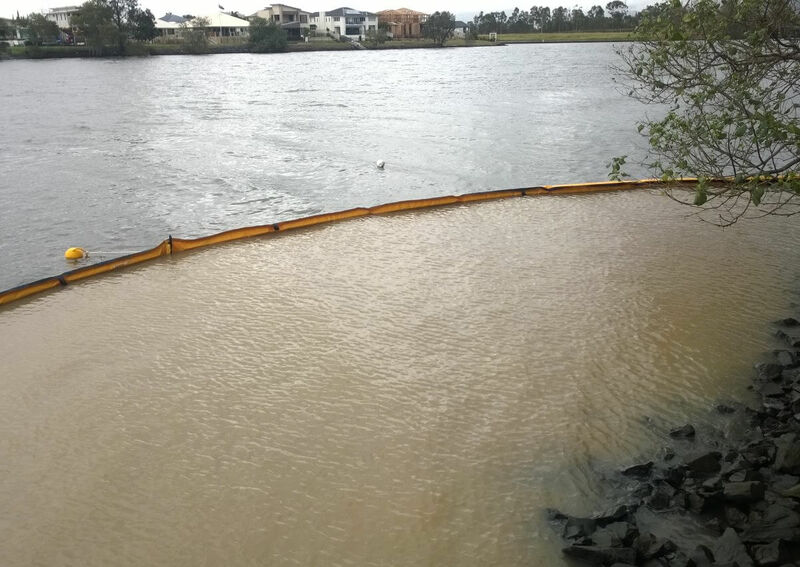 Two separate large plums of milky water were highly visible to motorists traveling the M1 and residents living along the Coomera River. Section A was an existing stormwater outlet of around 1800mm, across a stretch of beach where the tide was 3m daily. Careful installation was required to protect local wildlife and because of the risk that the Boom would become lodged during low tide. Custom furling was used to provide an angled batter to mimic the fall of the land. 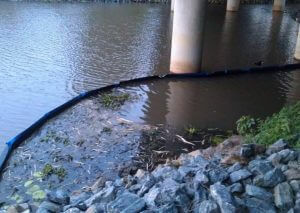 Section B was originally used as the preferred site to direct the runoff through the dewatering process. This was also the developers planned section of roadway and parkland that was to be completely excavated to lay large pipe and connect site stormwater drains. 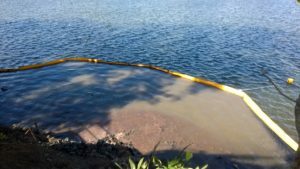 90meters of the boom was required to provide adequate catchment of sediment prior to and during the excavation process. 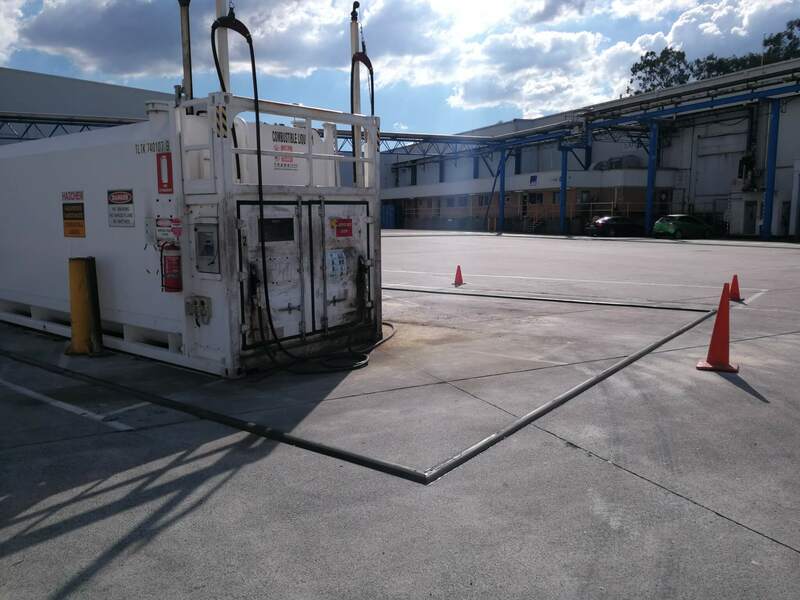 Jay & Jay Industries were required to undertake this sensitive project in full view of the public so site safety and environmental compliance was extremely important. This project was extremely time sensitive owing to Resident complaints, Local council demands of immediate compliance and an extreme weather event predicted in a matter of days. 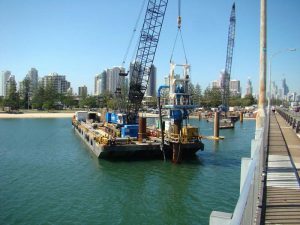 Completed in 6 stages covering Design Methodology, Supply of goods, Site direction, Dewatering, Installation of section A, Installation Section B, Compliance report to Environment and Heritage and GC City Council and finally return to site for removal after site remediation was complete. Design and manufacture a total of 150m of Silt and Sediment booms to stop the spread of Silted water into the Coomera River. 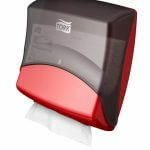 Design and Undertake a zero harm installation methodology and Installation practice. 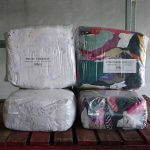 To support local wildlife population by following zero harm installation methodology. 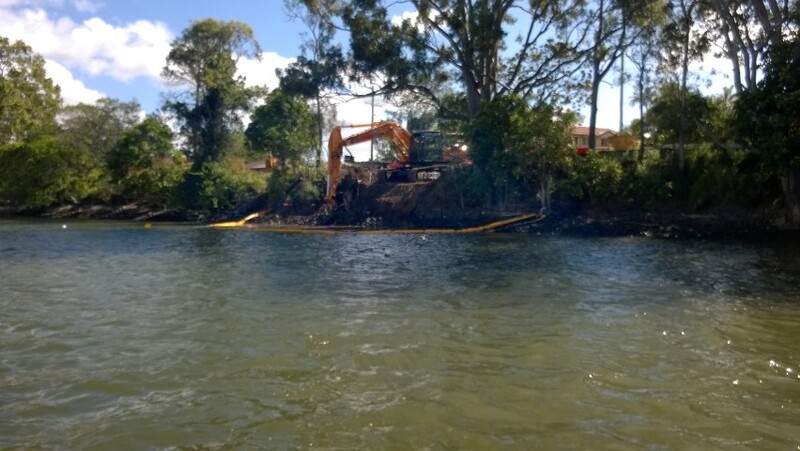 Protect Coomera River a known fish breeding habitat of the Gold Coast. Project coordinators were Jay and Jay Industries for Heran Building Group.